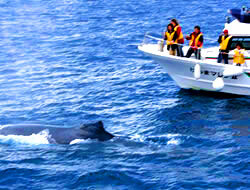 Whale Watching in Zamami For people on Zamami Island, whales are not just a source of tourism. They established a whale watching association in 1991 and have been making every effort to preserve whales on the coasts of the island. The effort includes various campaigns and implementing a set of regulations for whale watching, such as research cooperation with international organizations, preservation activities on which an enormous emphasis is placed, prohibiting divers from swimming with whales, banning underwater photography by mass media, and holding the "International Whale Watching Festa." A group of humpback whales visits Zamami in winter every year for mating, childbirth and child reading. The performance of whales is quite exciting, including breaching, tail slap, and many more impressive tricks. The Zamami Village Whale Watching Association makes sure that the whales are protected from any unwanted disturbances while still giving whale watchers a good view of the spectacle.